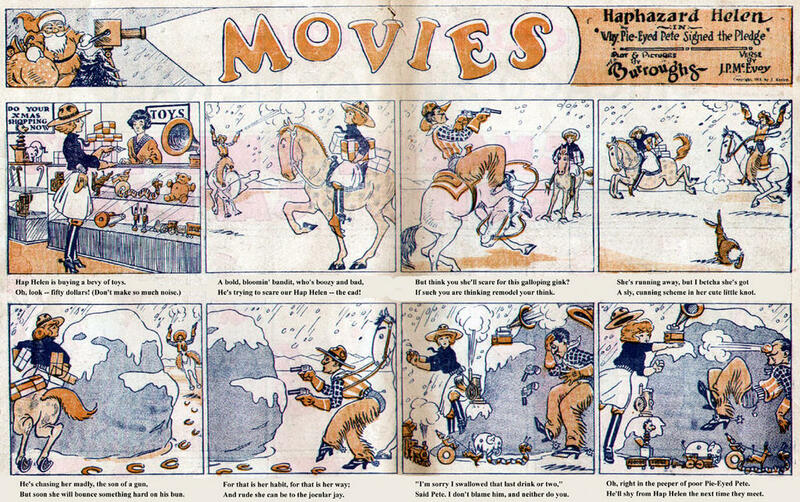 Here's a neat strip that mines the vaudeville tradition. Gallagher and Shean were a vaudeville comedy duo of the teens and twenties. Their lasting claim to fame is the classic pop comedy song "Mister Gallagher And Mister Shean". You can read more about the comedy team in Wikipedia here. 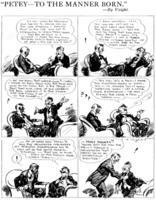 Anyway, the strip started sometime in 1923 (my earliest examples are from October) and ended April 19, 1924. Jo Swerling was credited with the strip, and on a few occasions I find a signature on the strip "Done By Dunn", so this Dunn may have been the bullpen artist who did the art. Unfortunately I have no background info on Swerling, nor can I say with any certainty who Dunn is - Bob Dunn? Alan Dunn? Charles Dunn? They were all cartoonists working in the 1920s. My guess is Charles Dunn, but anybody have a suggestion? Fantastic blog. Have all my envy and all my best wishes! This is another site I need to keep an eye on and look at often. keep up the good work. Jo Swerling (sometimes, or originally, Josef Swirling, born in Russia) was a friend of the Marx Brothers. 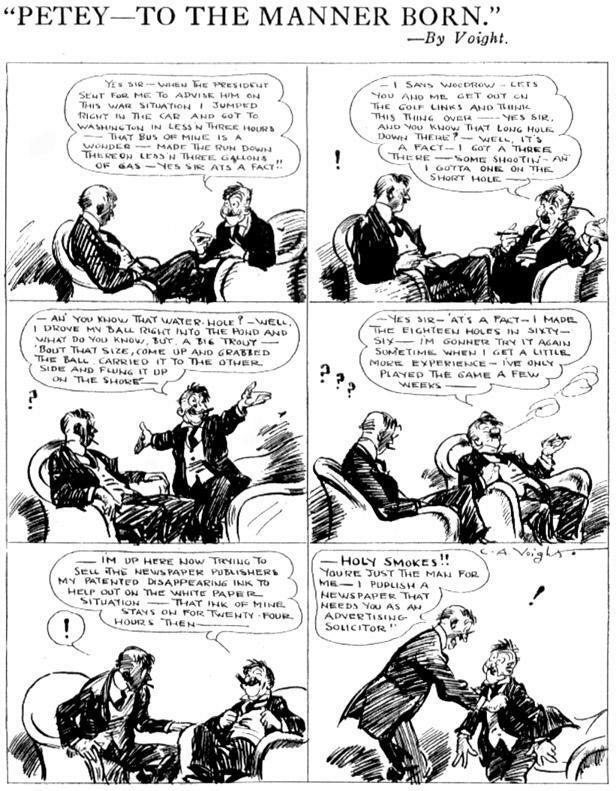 (Another cartooning connection: Groucho married the sister of Will B Johnstone, New York World cartoonist who worked on Marx Bros scripts) Swerling did the story for a lost Marx Bros silent of 1921, and worked on a 1918 stage routine of Groucho's. Anyway, Al Shean the great vaudevillian was the Marx Bros' uncle. Perhaps that is the connection when Gallagher and Shean "became" a comic strip and Swerling wrote it. Short-lived. The art was Charles Dunn, Hearst (und anderer) bullpen stalwart; NOT Bob Dunn, whose and drawing style put the possibility out of possibility. Swerling's Hearst-bullpen connections -- a friendship with Damon Runyon -- possibly paid off when he wrote the book (with Abe Burrows) for Guys and Dolls, for which they won an Emmy. However Swerling had a separate career in the movies (even briefly as an actor) -- writing duties on "Gone With the Wind" (uncredited) and "It's a Wonderful Life." He also did the screenplay for Hitchcock's "Lifeboat," and the original "Pennies from Heaven." His son Jo Swerling Jr is a movie producer ("The Brothers-in-Law") and many Stephen J Cannell shows -- "Baretta," "A-Team," "Rockford Files," many more. Hi Rick! Thanks for all the information on ol' Swerly (that had to be his nickname, right?). Any comic strip-related projects in the works right now, or are you concentrating on the country music or movie genres these days? Thanks for intro to Gallagher and Shean comic strip. Best wishes. Here's the first five installments of Mister Rumbles by Jack Sparling. The strip started on April 18 1955 and lasted until sometime in 1956. Can anyone supply a definite end date? The Eisner influence on Sparling is obvious here, but good art wasn't enough to keep this strip afloat. I guess the world just wasn't ready for an adult version of Barnaby or Calvin And Hobbes. No, I don't have the complete run, just the first few months. My run came from the Washington Post, which dropped it early. At newspaper industry get-togethers cartoonists often create some special art to commemorate the event. Since they’re cartoonists, they usually approach the job with humor and poke fun at their industry. The ‘big surprise’ of the New York Evening Mail’s “gambol” to 800 newspapermen and advertisers, at Cocoanut Grove, atop the Century Theatre, on April 26, was the joint appearance of Goldberg, Brinkerhoff and Voight, the Evening Mail’s cartoonists, in a comedy skit written for the occasion by Roy K. Moulton, the Evening Mail’s columnist. The sketch, billed on the program as “a tragedy,” told of the efforts of a newspaper publisher to buy a roll of print paper. “Paper King,” one of the characters, informed “Mr. P. Ubble Isher” that one roll of print paper would cost him exactly $9,000.00. In despair, the publisher turned to his cartoonists for assistance and after a whispered consultation they offered to help him out of his difficulty by lending him their “last week’s salary,” which happened to be the amount needed. 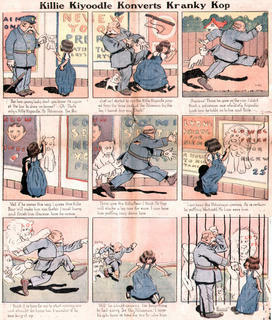 The above cartoons, by Goldberg, Voight and Brinkerhoff, are reproduced from the program of the Evening Mail’s party for its newspaper and advertising men friends. 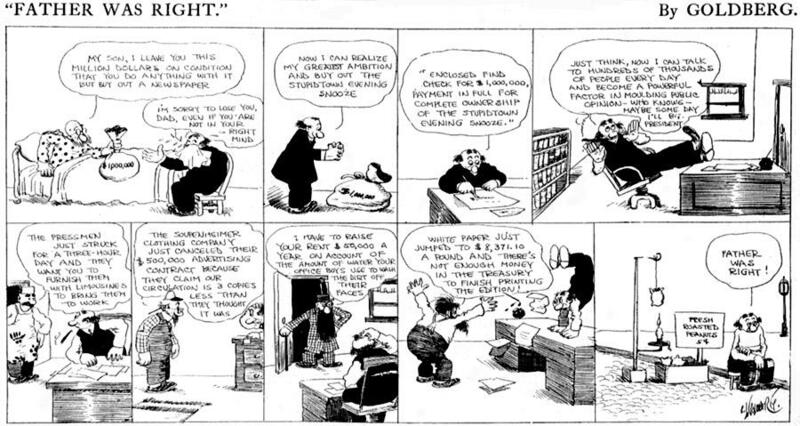 In 1914 the Chicago Record-Herald started a small comic strip syndicate. They had a mixture of second rate material, but they also printed early material by some cartoonists who would later go on to greatness. Among these are E.C. Segar (Popeye), Frank Willard (Moon Mullins) and Billy DeBeck (Barney Google). 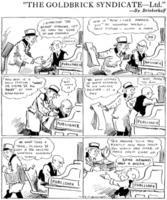 Today I’m posting images from some 1915 Chicago Record-Herald Sunday strips that are probably deservedly forgotten. Movies Featuring Haphazard Helen is the best of the group, with decent art by Carothers. Notice that the feature captions are done in rhyme. This was a pretty common device back in the oughts and teens – my impression is that some cartoonists thought that no one would notice that their strips weren’t funny if they were in verse. By the way, the captions were so small and faded that I had to replace them on the scan – sorry purists! 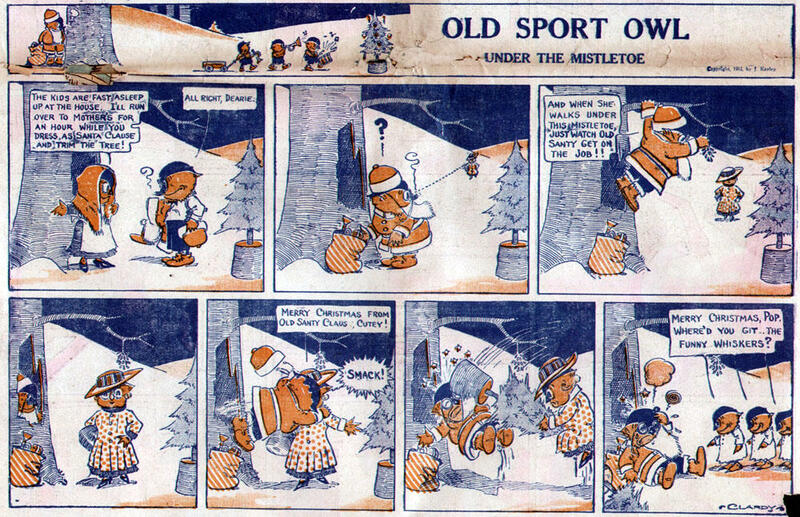 Next is Old Sport Owl by a cartoonist named Clardy. I don’t like to be negative, but this is just a plain poor excuse for a strip. Believe it or not, this thing ran both daily and Sunday for almost four months. Last is Roaming Rufus And Romeo by Joe Kohn. This is yet another take on the Katzenjammer Kids, but I’m not even sure if the protagonists are kids or adults. Although the art on this one is amateurish, I must admit to liking panel 7, where the old geezer’s pain is depicted with a thought balloon of him getting a tooth pulled. 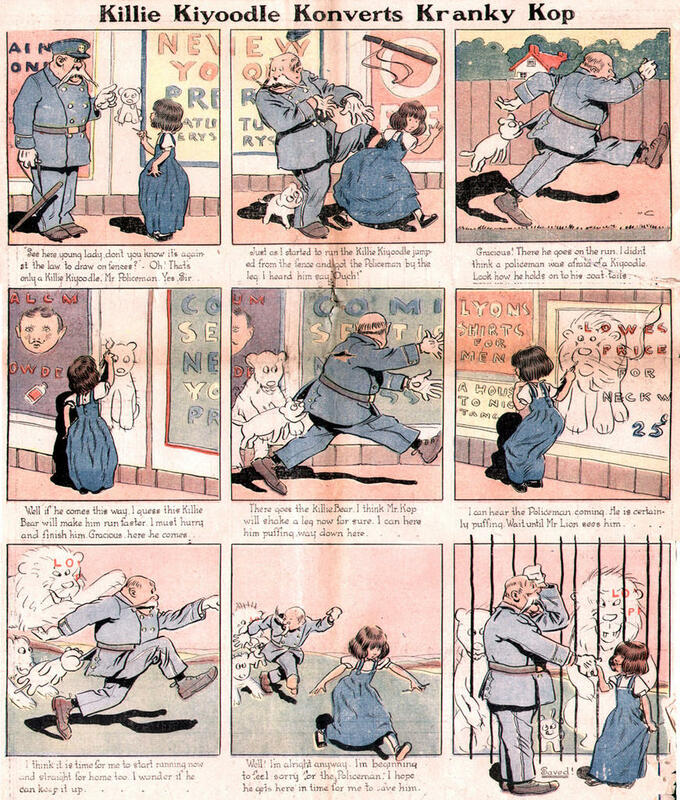 If you’re wondering why these strips only have one or two colors, it’s because until the 1920s it was typical for newspapers to print only the outside wrap of their comic section in full four color. The inside was almost always like you see here. Typically you would get black plus one color. Sometimes papers would use a second color instead of black (you can see this on Old Sport Owl where a dark blue is used instead of black ink). Papers that were willing to shell out more dough would go with three colors (black plus two more). When the 3-color scheme is skillfully handled the casual reader may not even realize that they’re not getting full color. As always, be sure to click on the images to see them at full readable size. As others have done, your site is now boolmarked and moved toward the top of the list. I can keep up with it all. "Haphazard Helen" who is that Burroughs being credited with plot and pictures at the top of the page? Good eyes, D.D.! Actually the posted strip is from late in the run after Carothers left. And therein lies great story that I'll relate one of these days. After Carothers' run, Burroughs took over, then Tom Rover, then someone who signed himself just "Bud", and then another semi-anonymous cartoonist who signed himself "Awrie". I also failed to mention that the bad versification was by none other than J. P. McEvoy, later a very well-respected writer whose credits include writing the "Dixie Dugan" strip. Here’s a sample of a great obscure strip, Dorothy And The Killies. It was written and drawn by B. Cory Kilvert for the New York Press in 1914-15. The premise is that anything sweet little Dorothy draws comes to life. Now Kilvert could have made this a strip full of sweet little unicorns and flowers, but instead his Dorothy is a little hellion with no time for drawing pink ponies and that sort of guff. Instead she draws homicidal beasts that she names, quite properly, Killies. They’re all bloodthirsty animals and she sets them on whoever is unlucky enough to be in the vicinity. In this example she sends a few of them after a cop. This, frankly, is one of the least grotesque strips of the series. I’ve seen a few examples that are downright disturbing. Wondering what the heck the New York Press is? It was a second-class newspaper, really just a holdover from the nineteenth century, when it was purchased in 1912 by Frank Munsey. Munsey was a publishing millionaire who wanted to form a national chain of newspapers and the Press was to be his New York link. 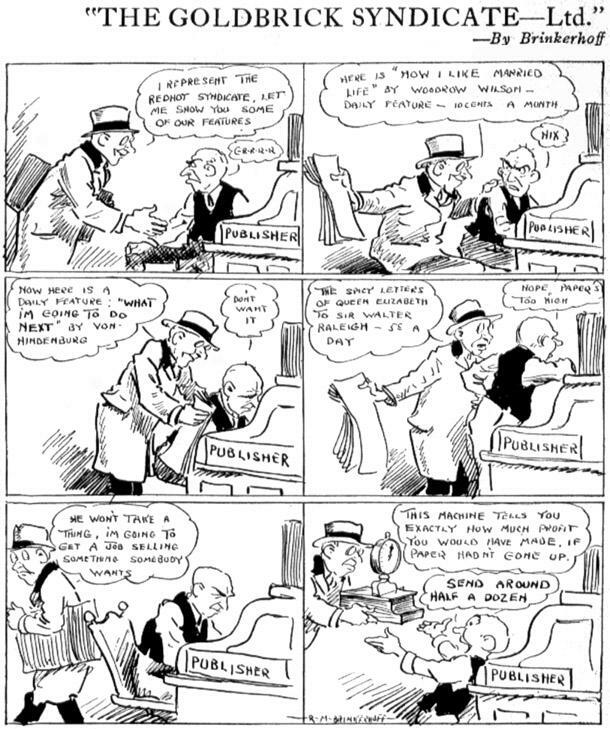 In 1914 he was talked into the idea of starting a Sunday comic section in the Press and syndicating the content to other papers. Munsey didn’t believe newspapers were a place for such frivolity, but he was talked into the venture. With little interest from the chief and a miniscule budget, the section was really on its deathbed from the start. The section lasted just a little over six months before going down the tubes. The newspaper itself only lasted until 1916 when it was combined with another paper (the Sun). The Sunday section contents were, if not of the highest quality, interesting from a historian’s standpoint. I’ll be posting more New York Press strips in the future. Be sure to click on the strip above to see it at a readable size. Can we get a few more of these. Very cool. Like the way the lion retains the lettering from he poster. Very imaginative.